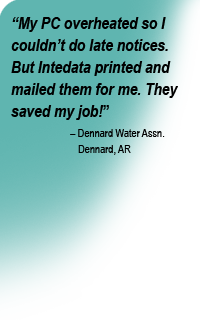 Intedata offers unparalleled technical support with a staff that knows the software inside and out. We answer your questions promptly and in plain English. We offer training programs designed with you in mind in a variety of formats for your convenience. You can also take advantage of the automation discounts offered by the USPS. CASS Certification allows us to process your customer addresses in a flash – verifying them with the latest postal service database and providing the required reports. From data conversion when the number of records is too large for your in-house resources to Remote Backup Plus to emergency billing services – Intedata offers unmatched, dedicated technical support for your peace of mind.